Nothing like a smile on your plate in the shape of a poached egg, bacon and maple syrup on your pancake 😀❤️ Cheered the weary teenager after a week and a bit of mock exams anyway! Pancake Day done, Lent begins tomorrow. ...I am not sure about egg & baco with Maple syrup. Hahaha - I love his big bulbous nose!! A very Canadian breakfast....? @peterday The teenager discovered it on a Bushcraft Camp when he was 10. They built their own shelters, baked bread under a stone in the ground and on the last day they were treated to pancakes with bacon and maple syrup. He decided that was absolute heaven and introduced it to us. I was surprised to find it was gorgeous! What a tempting way to start pancake day! Bacon and maple syrup is a marriage made in heaven! Only discovered this treat a few years ago and was so surprised to love it! We will be having lemon juice and sugar on ours today- that’s the way my mum always did them for us! Lovely! Looks very much like a clowns face to me. We don't have Pancake Day here, but one of my favorite things about 365 is learning about customs like this in other countries. Thanks for sharing this fun one! You were doing so well until you mentioned the maple syrup! 🤢Pancakes for us later - hubby can eat them as fast as I can cook them! Happy pancake day and I hope the exams went well!! Yum! Love maple syrup with salty bacon. Pancake day? Had to google it. Here it is Paczki day (Polish jelly or cream filled pastry). I could do either, happily! Nice breakfast shot! A great breakfast to start the day. Funny face. Pity the nose is not red. What fun. 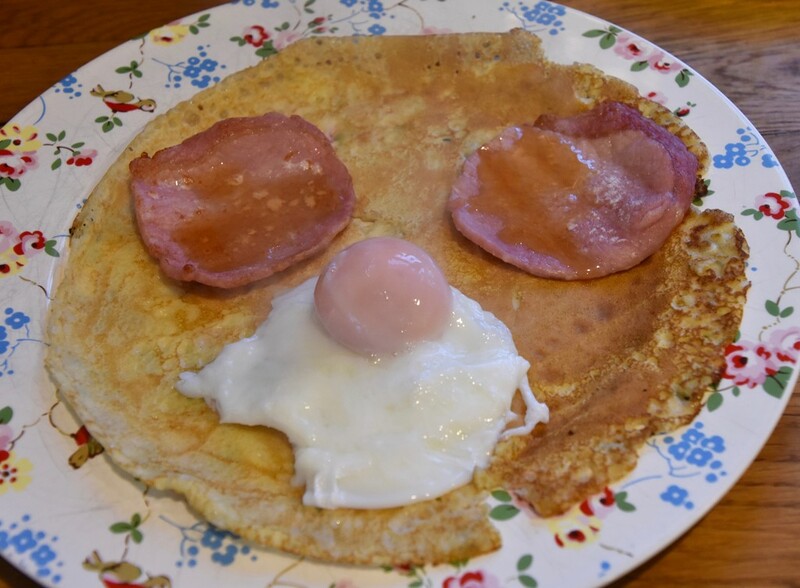 My wife used to make smiley faces in pancakes by cooking the facial features before pouring the rest of the batter. Made me smile. This so creative and it looks good, too. a great meal,but for me plain, with a touch of sugar and lemon. We are sitting here eating oatmeal with blueberries and my husband is adding pancake day as a recurring event on his calendar so he can have pancakes next year. Brilliant! And a happy teenager, too! Love the idea. @shutterbug49 That made me smile out loud! The pesky date moves every year, but always the night before Ash Wednesday. We love it! We were in Austria one year and I made a batch of pancakes with lemon and sugar for the hotel managers because they had never had them that way before :) Such fun! Fun capture made me smile too! Just talked to our buddy Peter today and he "scolded" (not really) me for failing to have pancakes for dinner tonight. I promised to make them in the near future! I guess that will break all the rules of Lent but we don't often follow the tradition. Your meal looks yummy! I must've missed Pancake Day. Damn. But I don't do Lent, so I think I'll do pancakes tonight. This looks just so yummy. I've always resisted any thoughts of bacon and maple syrup, but maybe I should reconsider. Lovely fresh egg BTW. I. too, was gobsmacked to find that maple syrup was a fab addition!